The Tech Community Christmas Party 2016! After a year of hard work and continued growth for the Nottingham tech scene; Christmas was a great excuse to bring the community together to drink, unwind and play some games together. The evening of Thursday 8th December 2016 saw a flock of 150 members of Nottingham's tech community converge upon the warm and welcoming National Videogame Arcade, in the heart of Nottingham. We were very pleased this year to have the support of our fantastic sponsors, without whom the party could never have gone ahead. A huge thanks to Capital One, Cordius, MHR, Accelerate Places, Esendex and JH, plus thanks to Steve and Annie Haley of Multipie for buying the whole party a round of drinks! Nottingham.digital - the comprehensive listing of all Nottingham tech events has been updated with a new design and is more useful than ever. AP Tech Talks are a new series of events hosted by Accelerate Places, the first of which is on Thursday 19th January. 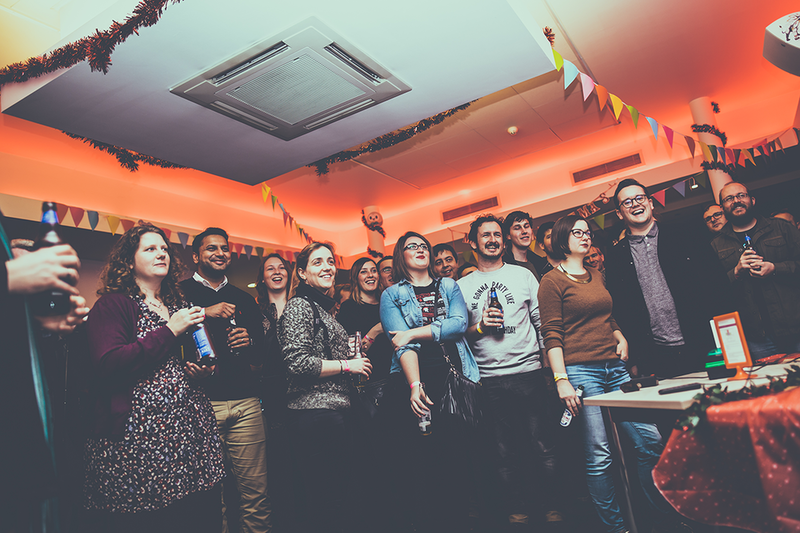 Startup Weekend Derby is coming on 10th-12th March at the University of Derby. The Women in Tech Conference returns to the University of Nottingham on 18th February and the lineup is amazing! All are welcome, be sure to check it out. The Nottingham AI Meetup runs monthly over at Accelerate Places, follow them on Meetup to find out about the next event. Tech on Toast - Tech Nottingham is launching Nottingham's first before-work tech event on Wednesday 18th January, 7:30am-9:00am at Accelerate Places. Come along before work to get a free breakfast, to hear some of Nottingham's brightest talk about their companies and their projects and to socialise with the other members of the local tech community. Hack24 Nottingham's biggest coding event returns to the Nottingham Council House on 18th and 19th March 2017 - tickets are free but they will go fast - don't miss it! Tickets for the party sold out it under a minute, and with a full house of 150 in attendance; the atmosphere was buzzing. Spread across four floors, the NVA provided the perfect opportunity to spend time with friends and colleagues exploring games old and new. Particular favourites were the virtual reality kit (following a comical and thorough Health & Safety briefing), the music room and the snowball fight game in the lobby. Prizes were awarded for the best photographs throughout the evening; with Charlie Gentle the lucky winner of an NVA family ticket and Adam Field winning an Amazon Echo Dot (Top tip - Ask her about the three laws of robotics). The evening finished with a flourish, our massive games tournament ended with Team Pink instigating the worlds longest conga* and subsequently taking the prize. Thanks to the enigmatic and fantastic Gamesmaster Joe for organising it! A big thank you to all of you who came to the party and all of you who have worked so hard to make this such a fantastic year for the Nottingham tech community! This month we welcome Paul Smith and Andrew Seward to the Tech Nottingham stage - Plus we've got free food and drinks provided at the event thanks to our sponsors. At Tech Nottingham we are very pleased to announce our new morning event Tech on Toast. Come along before work to get a free breakfast, to hear some of Nottingham's brightest talk about their companies and their projects and to socialise with the other members of the local tech community.